The Joseph Lyddy Pet Indulgence Mega Oral Care is a food additive you can easily spray on top of your dog’s (or cat’s) food. It does not make any specific claims in relation to controlling or removing plaque and tartar but promises to help improve oral health and assist with freshening your dog’s breath. You could refer to it as a doggie mouthwash. For the record, our dogs don’t have bad breath (I checked with all three .. thoroughly .. a few times) and it probably has a lot to do with the food they eat. We won’t recommend any particular brands here but the reality is that if you feed a high-quality balanced diet, this is one of the added benefits in addition to a longer, healthier life. According to the AVA (Australian Veterinary Association) 4 out of every 5 dogs (or cats) over the age of three show signs of oral disease. 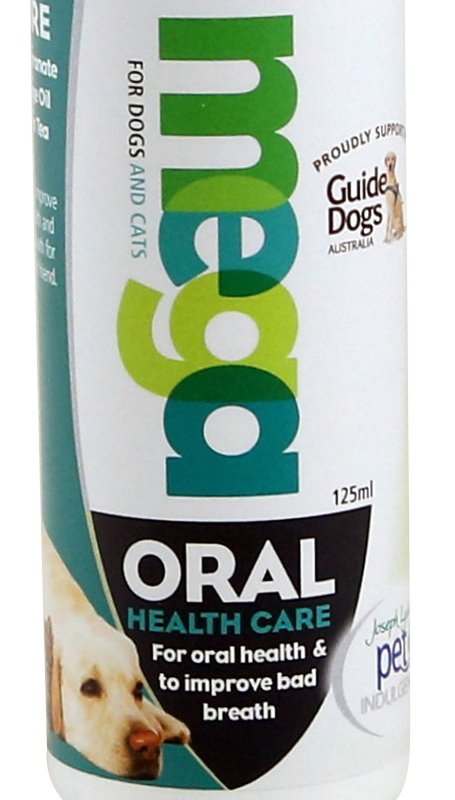 Bad dog breath also appears to be a common issue for many dog owners and we thought we should trial one of the latest oral care products available for dogs and cats. One of the key things to prevent dog bad breath from occurring in the first place is to ensure proper dental hygiene to avoid the build up of tartar or plaque (bacteria accumulate and end up surfacing on your dog’s teeth). You can do this by using daily a dog toothbrush and toothpaste or scheduling a doggie dental at the vet (which usually lasts a couple of years). Providing the occasional raw bone or chicken wing appears to be more effective than a lot of crunchy or chewy dog treats on the market as these end up being swallowed by our pack in a matter of seconds. If these tips still don't work for you, you can reach out for the Joseph Lyddy Pet Indulgence Mega Oral Health Care food additive. The 125ml pump bottle contains a combination of Pomegranate, Green Tea and Orange Oil synergistically blended, thought the exact % breakdown is not listed in the ingredients’ panel. Allow 2 squirts per 5 Kg of body weight. This meant 12 pumps (around 6ml) for our 30 Kg Belgian Malinois Porthos - who volunteered for this project. We added the Mega Oral Care to his food twice a day – it depends on how often you feed your dog of course. My limited human nose could only detect a faint orange oil fragrance after it had been sprayed onto his dry kibble. For the sake of this review, I actually squirted a small amount of product on my finger and found its consistency quite viscous. For the record, my dog could not have cared less. He has never been able to tell when I’ve added something to his food including his medication after an operation and he will eat with enthusiasm the same food every day even when fed using a slow food bowl. Probably because humans win the sensitivity contest for taste with 9,000 taste buds as compared with only 1,700 for our dogs. It will take a few days to detect any noticeable difference and it will also depend on how serious your problem was in the first place. Our verdict is to give the Mega Oral Care freshener a try if you have serious issues with your dog’s bad breath, however please ensure this is not the sign of a more serious health issue by having first a wellness check at your local vet.